Apple’s 3D Touch feature is now (kind of) available on Android. 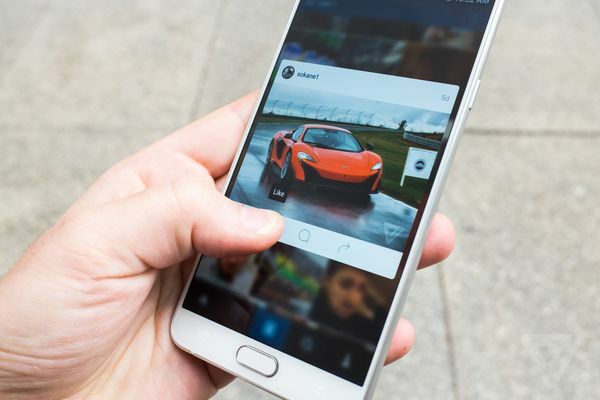 Earlier today some Android users of Instagram found that the app now includes nearly a direct port of the iOS app’s 3D Touch user interface, with two big differences: the new feature is only available in the app (you can’t do anything new with the home screen icon), and you have to long press to activate the feature, since Android phones don’t have pressure-sensitive screens — something unique to the newest iPhones. So what does the new functionality do, exactly? Any time you find yourself looking at a grid of photos in the app — whether you’ve searched a specific hashtag, or are looking at someone’s profile — you can now long press on a thumbnail and “peek” at a nearly full-size version of the photo. (For the unfamiliar, “peek” here means a card will pop up in the foreground of the app, while the rest of the UI blurs out.) Once that card is up, you can slide your thumb or finger down to a row of three buttons, where you can like the photo, send the photo to a friend using Instagram Direct, follow the user, or leave a comment if you already follow them. The app uses haptics here for extra feedback as you roll over each of these options, too, which is good because your finger will likely obscure them. To leave the card and go back to where you started, you just slide your thumb or finger away from the buttons and lift it off the screen. While this new bit of functionality is nowhere near revolutionary, it’s a nice added touch to the Android version of the app. Moreover, it was smart of Instagram’s developers to recognize that changes they’ve made to the iOS app had value outside of Apple’s new paradigm of pressure-sensitive screens. The new feature is available in the 7.13.0 update to Instagram, which hasn’t quite made it to the Play Store but is available at APK Mirror. Update December 8th, 9:00 PM ET:Instagram has reportedly pulled the update that went live to some users in the Google Play store earlier today. It appears the feature is a test, and may roll out in a future update of the app, but it’s still available via APK Mirror.